Mass Tort? What About a Class Action? Similar claims and similar plaintiffs? Isn’t that a class action? Not always. In order for a case to be considered a class action, it has to meet certain procedural requirements, and the plaintiffs’ injuries have to be essentially the same. Plus, the verdict and recovery are going to be the same for every plaintiff in a class action. The problem with this is that each individual plaintiff may have suffered a different type of injury or their injuries may have varied in severity. Mass tort actions take that into account by consolidating only the pre-trial proceedings, as opposed to the actual trial and verdict. The most important pre-trial proceeding is, of course, discovery, so consolidation allows for plaintiffs’ attorneys to work together during the discovery phase to streamline and avoid wasted time for the plaintiffs, defendants, and courts. A good way to tell these two apart is to think about this situation: your 20 year-old son, your 80 year-old aunt, and your 2 year-old nephew each purchase a bottle of soda. Let’s say the soda is tainted and causes each of you to contract pneumonia (all the more reason to drink water). Pneumonia is going to effect each family member differently, so each should be entitled to a recovery against the soda company that aligns with the severity of their injury. That’s where a mass tort comes in. On the other hand, lets say each family member bought a soda, and a year later the company was found to be guilty of price-fixing, meaning each of your family members paid $1 more than they should have for the soda. Each of their injuries is the same here ($1 loss), so a class action is the way to go. The decision to consider this a mass tort is similar to the Feds’ decision to establish “multi-district litigation” for the Xarelto suits in Federal Court. This, once again, is a fancy way of saying that different courts in different jurisdictions are getting the same cases, so let’s not waste everyone’s time and money doing the same discovery and ruling on the same pretrial motions over and over. 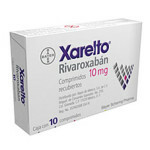 A federal judge in Louisiana currently has the 86 pending Xarelto cases on his docket. In spite of Xarelto defense counsel’s unwillingness to do so (based upon their argument that most plaintiffs were from out of state), the PA cases will be transferred to the state’s Complex Litigation Center. Granted, a few cases will be selected for early trial dates, allowing plaintiff’s attorneys to dip their toes into the water, assessing jurors’ initial response. But still, they’re not binding on other trials. Xarelto litigation keeps pouring in, yet Bayer and Johnson & Johnson are only pushing the drug harder and seeking more ways for people to buy it. Of course, millions of dollars in settlements and litigation seems like a drop in the bucket when the drug is already raking in almost $1,000,000,000 per year, with that number likely to only go up if the FDA approves the drug for more types of usage.